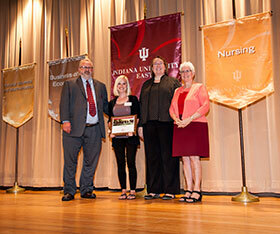 Indiana University East celebrated the accomplishments of its students during the annual Honors Convocation held April 20. Olivia Robinson, an elementary education major with a minor in mathematics, is learning by doing. As part of her Honors Senior Thesis, she single-handedly designed, coordinated, and conducted a mathematics tutoring program at Northeastern Elementary School in Fountain City, Ind. 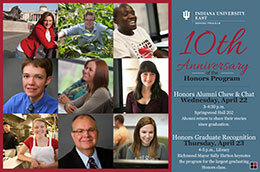 The Indiana University East Honors Program will host the 2016 Mid-East Honors Association (MEHA) annual conference April 1-3. More than 200 students from 20 different colleges and universities will visit the IU East campus for the prestigious event. School of Natural Science and Mathematics Dean Neil Sabine, Chancellor Kathryn Cruz-Uribe and Executive Vice Chancellor for Academic Affairs Larry Richards present the Outstanding Student in Biology award to Hillary Chaney. 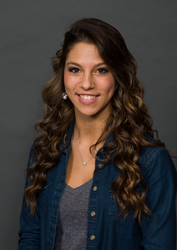 Maddie Truette and Jarrod Lemar have been chosen as the 2014 Lingle Scholars. 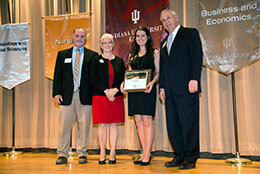 The scholarship award will continue throughout their pursuit of a four-year degree at Indiana University East. Both graduated in June 2014 and are freshmen at IU East this fall. Truette is a graduate of Centerville Senior High School and Lemar is a graduate of Richmond High School. The Indiana University East Honors Program inducted 46 students during the annual Honors Induction and Pinning Ceremony held November 21 in the Hayes Hall Campus Library. 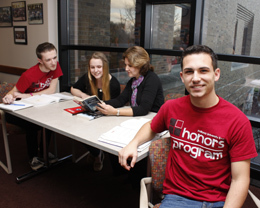 The Honors Program is an academic program that provides an intellectually enriched curriculum for highly-motivated students.